A TNC horse-hiring advertisement. Source: Craigslist. For legal purposes, “Transportation Network Companies” (or TNCs) such as Uber and Lyft are defined as services that “facilitate rides between passengers and private drivers using their own personal vehicles.” Increasingly, however, drivers for these and similar “ridesharing” platforms will be driving cars that they have leased or rented. Last week, Uber announced its Xchange Leasing program, which is designed to expand Uber’s driver pool to include those who do not have—or do not want to ply for hire with—their own vehicles. With this leasing program, and a rental program being piloted in select cities, Uber is taking a step into a growing phenomenon in the “ridesharing” industry. Numerous companies, large and small, are renting or leasing cars to drivers to operate on the Lyft or Uber platform. This is just another example of the ways in which “ridesharing” services are recreating aspects of the taxicab industry. In this case, what is being recreated is a very old practice—to wit, horse-hiring. 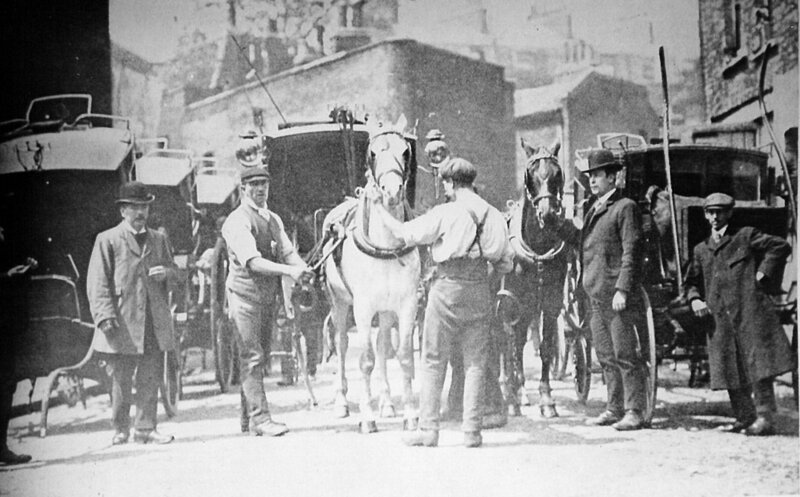 Horse-hiring in a London cabyard. From Vance Thompson, "The London Cabby," 1904. Courtesy of Taxi-Library. Horse-hiring was eclipsed in the Twentieth Century by the spread of the employee-cabdriver model, in which companies tracked cab income using the newfangled taximeter, and split the earnings with drivers (this is one of the reasons why Uber, which takes 20% to 25% of each fare, is currently faced with class action lawsuits for treating its “independent contractor” drivers as employees). Horsing - horse-hiring - A small fleet owner, with 18 or 20 cabs, hires a driver to take car out, buy his own gas and oil, and pay the company $5.00 a day for the cab. What he makes above this is his own. This practice is called “horsing.” (from Marion Charles Hatch, "Stories, Poems, Jargon of Hack Drivers," 1938). The short-term commitment made possible through horse-hiring created a flexible, intermediate model between the independent driver, who owned and operated a single cab, and the employee driver who worked for the big fleets. With the collapse of the employee-driver model in the 1970s and 1980s, many large fleets turned to horse-hiring; this led to the independent contractor status shared today by cabdrivers and “ridesharing” drivers alike. TNC horse-hirers come in all sizes, big and small. Last summer, I watched the spread of TNC horse-hiring advertisements in Craigslist’s Jobs-Transport section. First appearing in San Francisco, these spread rapidly to Los Angeles and other large Western cities such as Phoenix and Dallas. A larger horse-hirer with more funding and media coverage is Breeze, which started in San Francisco and has since spread to five other cities; other large players include HyreCar, a horse-hiring marketplace available nation-wide (though spottily), and Flexdrive, a Cox subsidiary which rents cars to Uber drivers in several Southern cities. And now Uber itself is getting into the game. For drivers, the attraction of horse-hiring is clear. As many ridesharing drivers have discovered, driving your own car as a taxi adds up to a lot of wear and tear on your personal vehicle. The more miles you drive, the more your car depreciates in value; an accident could result in painful out-of-pocket expenses, and put you out of work until your car gets repaired. Rideshare drivers in many states are still in legal limbo regarding insurance, unsure of what kind to buy, or how, and often avoiding the issue by hiding the fact from their insurers that they drive for hire. Horse-hiring does away with all of those problems. Many leases cover maintenance, or even include insurance; when a vehicle gets worn down, or is involved in an accident, the lease driver can just switch it for another. Although renting a car involves a higher up-front cost (these are businesses, after all), that is a cost the driver knows ahead of time, unlike the uncertain costs of maintenance, repairs, and insurance claims which fall in the lap of the owner-driver. Fleet owners enjoy economies of scale over individual car owners; if horse-hiring leases reflect these savings, renting could even be cheaper than owning for TNC drivers. The “ridesharing” movement has shifted many of the risks of taxi operation onto the drivers; horse-hiring is a way for drivers to shrug off some of those risks. 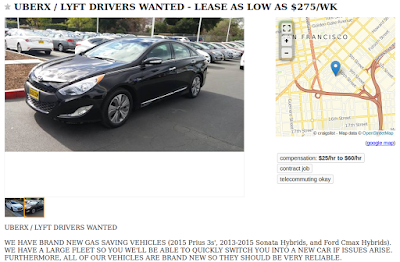 This San Francisco horse-hirer offers drivers a range of leasing options. Source: Craigslist. Horse-hiring in the TNC world is still young, and different companies are experimenting with different versions (longer or shorter term rentals? insurance included or not? mileage caps or no mileage caps?). However, it can be expected to grow. This should not be surprising; it is just another way that the development of the “ridesharing” industry is recreating economic structures and relationships which have long existed within the cab industry.